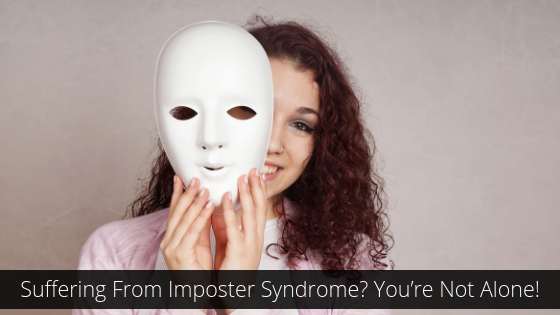 Imposter Syndrome is a condition that isn’t often talked about but can affect large numbers of people. What is it? According to Wikipedia, ‘Impostor syndrome is a psychological pattern in which an individual doubts their accomplishments and has a persistent internalized fear of being exposed as a “fraud”. Despite external evidence of their competence, those experiencing this phenomenon remain convinced that they are frauds, and do not deserve all they have achieved’. Most of us suffer at some point in our careers, with women more at risk than men. An estimated 70% of people experience these impostor feelings, according to a review article published in the International Journal of Behavioral Science. In another, a OnePoll study conducted on behalf of Access Commercial Finance, a quarter of women (26%) said receiving criticism was the biggest cause of their imposter syndrome, having to ask for help (22%) and colleagues using confusing acronyms or technical jargon (16%) were all key causes. But those of us who fear being found out as a fraud are in great company. Albert Einstein, Maya Angelou, Kate Winslet and Meryl Streep to name a few, are all reported to have suffered at some point. The Perfectionist: Perfectionists set themselves goals that are often impossible to achieve and then experience doubt and stress if they can’t meet those targets, almost setting themselves up for failure before they start. The Superwoman/Man: Closely linked to perfectionism, the Superwomen and Men often push themselves to work harder than anyone else to cover up their insecurities and fear of being shown to be an imposter. Arriving first at work and leaving last, in the hope no one will doubt their abilities or call them out as a fraud. The Natural Genius: There is a tendency for some people to think their natural abilities are more valuable than their effort. If they have to work at something, they can’t be very good at it. Self-doubt rears its head all too quickly if they don’t get things right on the first try. The Individualist: These people believe if they have to ask for help, they have failed. Not asking for help or being afraid to ask questions are typical signs that maybe a fear of being found out as an imposter, is keeping them quiet. As Bruce Lee once said, ‘A wise man can learn more from a foolish question than a fool can learn from a wise answer.’ Those individualists out there, take note! The Expert: A fear of being exposed as inexperienced or less knowledgeable than people/employers took you to be, is a common type of imposter syndrome. So, now you know you’re suffering, what can you do about it? Working on your self-confidence is a great way to start, and learning to embrace and accept your achievements will not do any harm either. We Brits always fear being accused of bragging, but it doesn’t make you an insufferable show off, just an awareness of your own worth and achievements. Another option is to try mentoring. Not only is it a great way to give back to those following in your footsteps, it can also make you realise that you do know quite a lot, maybe even revealing skills and experience you previously took for granted and were unaware of. It’s also empowering to know you might have helped someone else in their career and can share your experiences of Imposter Syndrome, so they can be aware of the pitfalls. Imposter Syndrome should actually be seen as a symptom of success. If you’re feeling like a fraud, maybe it is because you are doing something right! Of course, talking to a healthcare professional is a good idea if you feel you are suffering an acute case of Imposter Syndrome and the above ideas are not going to cut it. Suffering in silence and ‘soldiering on’ is not healthy and could be the only thing holding you back from your next career move.